This listing is for 10 Turtle Soap Favors in your custom colors and scents. Perfect for bridal showers, weddings, baby showers, bridal showers, birthdays, weddings and more!. Each favor includes one sea turtle. Soap measures apx. 2 1/2" long and 2 1/4" wide about 1" thick. Not only do these look adorable, but each soap is made from our luscious lather shea butter moisturizing soap base and will leave your skin soft and moisturized. 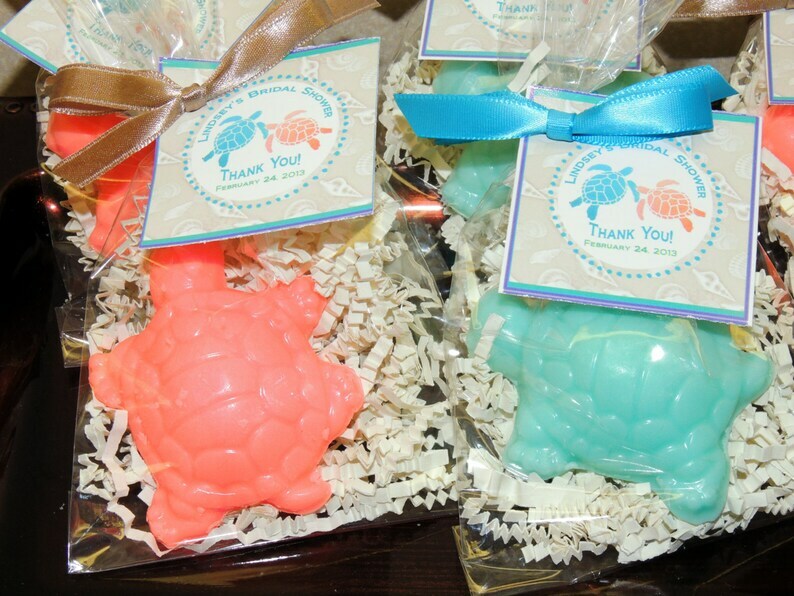 This shop did a great job of customizing the colors of the turtle soaps to match my baby shower, which was an under-the-sea theme. I got two colors of turtle soaps, blue and hot pink, and the tags were a combination of both colors. They turned out perfectly.